I love to sew and make things, and I want to share my process. My inspiration has not changed from what I thought was awesome when I was a kid. I hope you enjoy what I do. 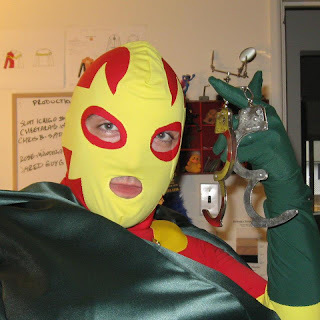 October is officially my new July- between New York Comic Con and Halloween I am up to my eyeballs in costume requests. While I am very happy to sew sew sew I am fortunate enough to take a few days and celebrate costumes and everything nerd-a-rific at NYCC. These photos are teasers of some of the good stuff I've been working- if you're going to NYCC look for Booster Gold, Mr. Miracle and an all around awesome JLA group. Come say hi and get a pic! Come join us at Baltimore Comic Con this Saturday and Sunday. Cosplayers come say hi- I would LOVE to see what you are wearing! Look for the yellow banner and come warm yourself by our fireplace! Fireplace?? It's 90 degrees out! You will have to come see us to find out if we are making s'mores or not. Don't forget to check out the new merch! 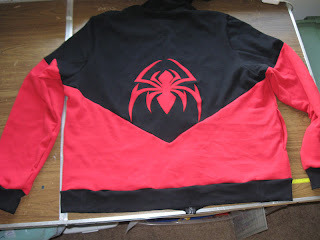 This is based on a new version of the Scarlet Spider that is well scarlet. 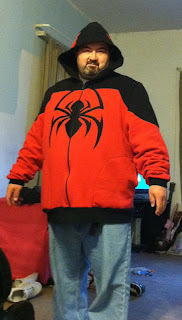 Perhaps in the future I will make a garment based on the classic blue and red Scarlet Spider costume. In fact I think it's a must, because how often do you find a superhero costume that already has a sweatshirt? Weird, right? Anyway, this design was a joy to work with. The spider detailing was very time consuming, but well worth the excellent results. Read more for detail pics of the hood and WIP pics. I Need a Break from this Hot Super Summer, Time to Shower with the Avengers! 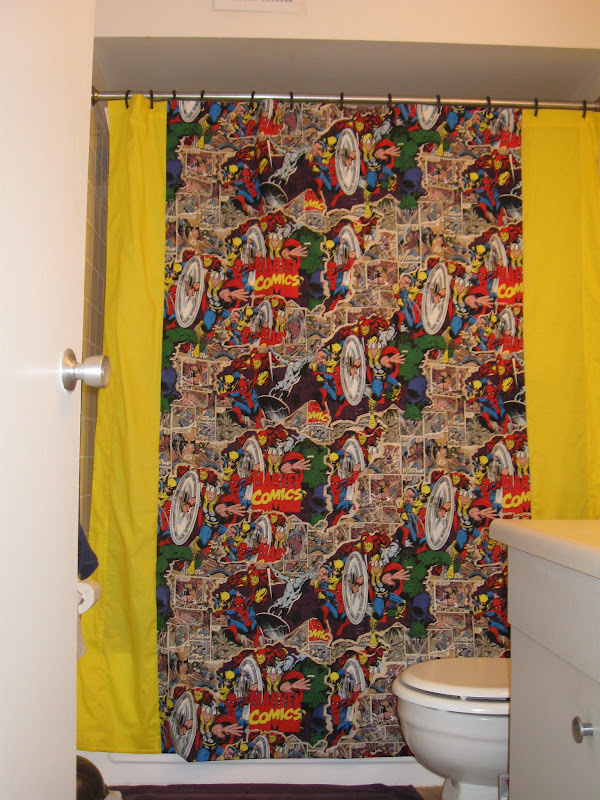 One of my favorite things about superhero movies coming out is all the fun merchandise that accompanies it- especially the fabric. I found this fabric particularly awesome and couldn't bring myself to actually cut it up. 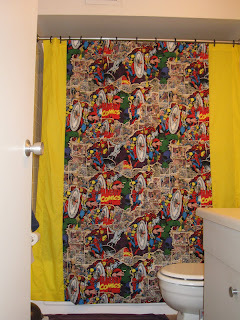 So I didn't, I added some yellow side panels, gold grommets for a one-of-a-kind super-awesome shower curtain! Who wants a 3/4 sleeve sweatshirt with red zipper and white side panels?? Oh, and don't forget the kicking silk scarf. Awwww, teeny tiny Assassin's Creed hoodie! Anything that can fit in the palm of my hand is automatically cute. 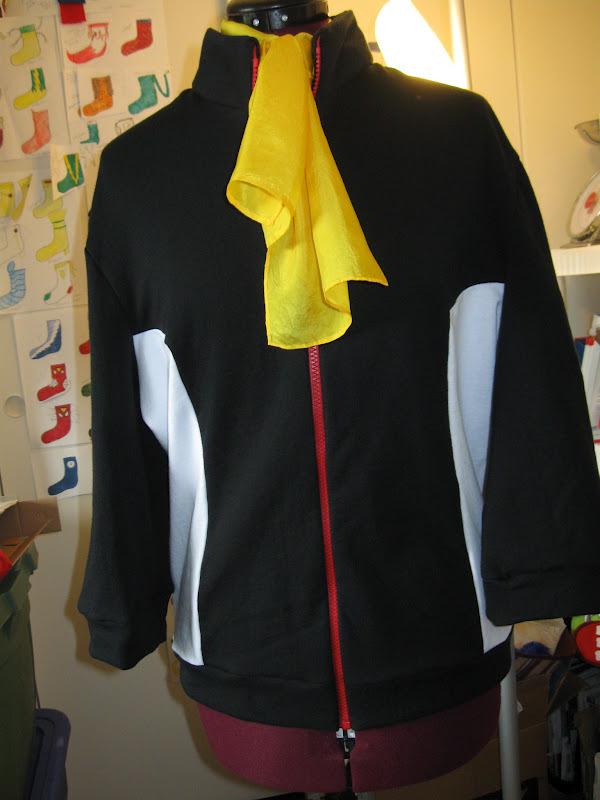 I tried to add all the same details and seams that I did on the full sized hoodie, which can be seen here. Here is a work in progress Deadpool costume. How would you like to be greeted by this at your local comic book shop? If you go to Encounter Comics and Games in Allentown PA you just might find him. Still to come: weapons and belts! Stay tuned for the finished costume on Free Comic Book Day!